Oh the weather outside is frightful! I just love this photo of Sam from 2016. I knew that after seeing the Winter Puffy Stickers and the Let it Snow stamp from the December reveal, I wanted to document this moment in a 6×8 double page spread. 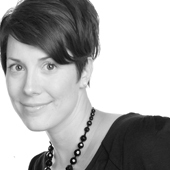 This page is about one of the most memorable snowfalls in Toronto. At the time, I took baby Sammy in a sled to pick up his older sister from school. 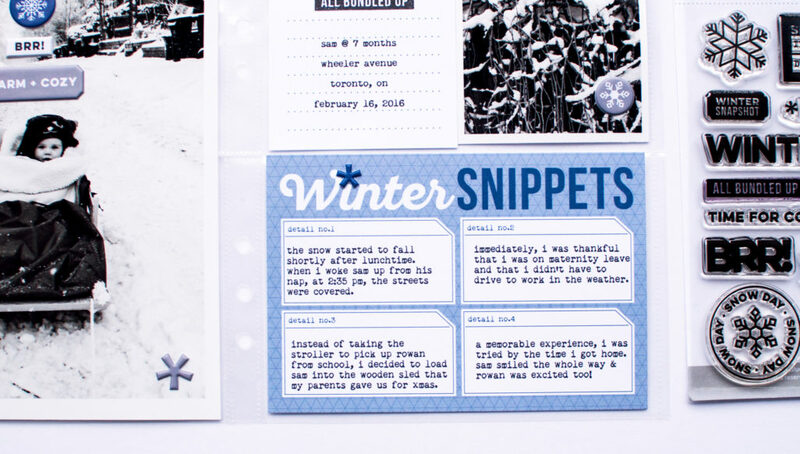 I just love that 4×6 “Winter Snippets” card from the December 2018 Monthly Kit and I used it to tell 4 facts from the day. Is that a blue, purple and teal winter colour combo? Oh my! Just like my previously layout, I have been waiting for a specific set of products to document our 2016 Family Day excursion to Niagara Falls. 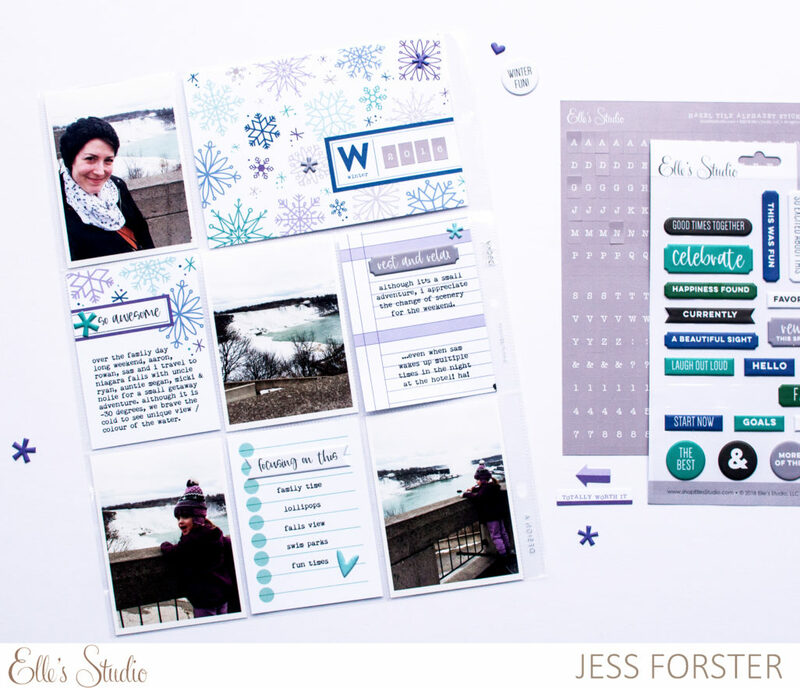 I am a huge fan of purple and you don’t often find purple snowflakes on journaling cards. I loved that multi coloured snowflake card in the December Kit. Also I heart those puffy stickers 🙂 Like usual, I added this durable embellishments to create a visual triangle. I add some fact and feelings journaling to three, 3×4 cards and called it done! I love the non traditional winter colour schemes in both layouts. Elle’s Studio Kits are on sale now! Thanks for looking! 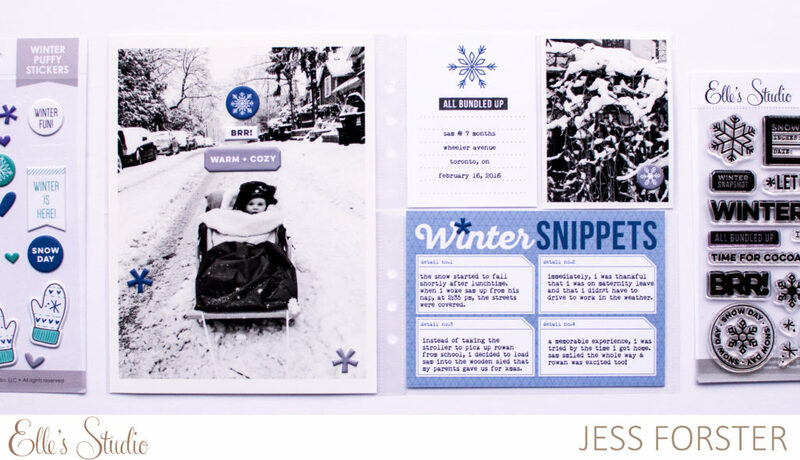 Cheers, Jess is a memory keeping blog that provides simple and guilt free ideas for documenting everyday moments using pocket page protectors. 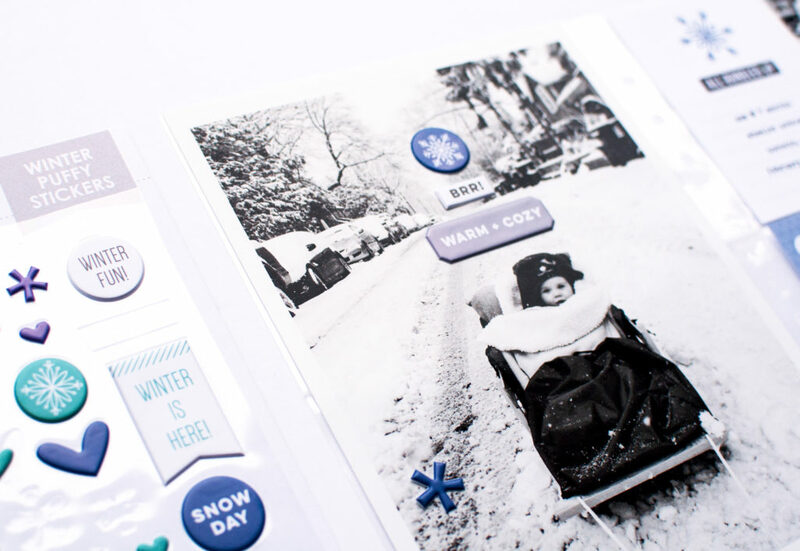 Based out of Toronto, Ontario, Canada, I celebrate light hearted family moments and simple scrapbooking projects. Thanks for visiting!